Diggers Valley: 19 Jun 2010. The week beginning the 19th of June 2010. Still in Auckland. Pip and Tony, friends from Kaukapakapa, now living in Orewa, picked me up this morning and took me up to see their new home and spend some time with them. It's always an entertaining visit, wherever they may be. In the evening I had agreed to look after the three children while Jude and Roger went away for the night. After the children had dinner and went to bed (happily very easily and quietly), Iphigenie arrived to spend the evening with me. We hadn't seen each other since she was last up here. Jude had made a lasagne for our dinner, and we followed that with some of the extra dessert I'd bought last night with Rachel. Then we submerged ourselves in the spa out on the deck, for a relaxed hour or two of conversation. Jude and Roger came home and after lunch Jude took me out to the airport. It was good to get back in time to have a walk around some of the animals before dusk. Here's 572, looking a bit messy around the rear. 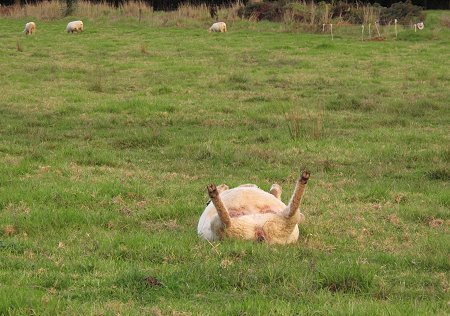 One might quite easily to fail to see that there was anything amiss with this cow, if not looking carefully. 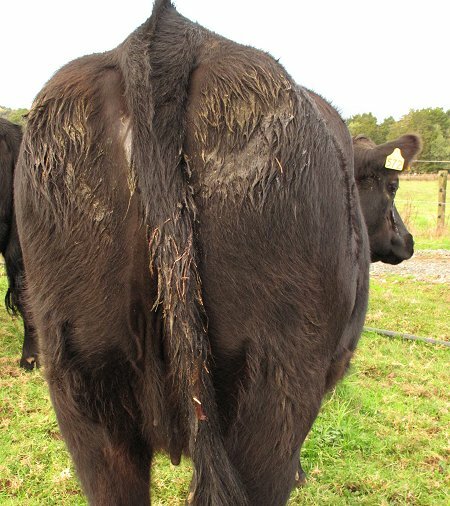 But the smears on her rear are not faecal, they're dried mucous and there's a bit of freshly expelled bloody-looking thick mucous caught on her tail. It all smelt quite normal, so I am still confident that all is well - other than there being no calf in there any more. 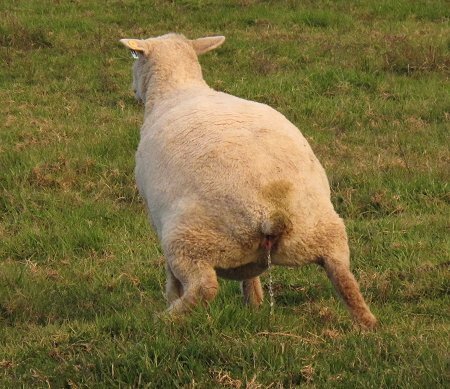 This is the crazy young ewe which is regularly cast. She hadn't been down for long, but there was no way she could get up on her own. When they're down their bowels will work, but they can't urinate, so when they get up, that's usually the first thing they do. She's now about half-way through her pregnancy, and we'll have to watch her carefully as she gets heavier and rounder. I took 572 in to the yards so I could do a belated internal check, just to reassure myself that everything's ok inside her. 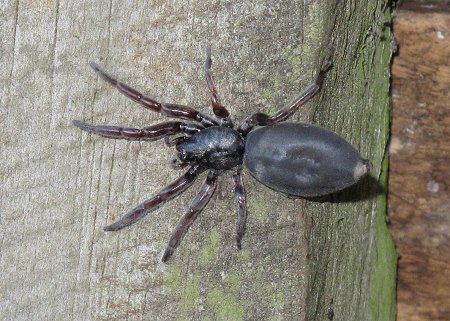 When I slid the closing latch on one of the headbail side gates, this large white tailed spider lumbered out from one of the crevices. Its body was about 2.5cm/1" long. I have absolutely no hesitation in squashing these spiders! They're an Australian import from long ago, although they've only been particularly noticed in this part of the country over the last fifteen or twenty years. Their bite is painful and in some people leads to nasty ulcerations - although not from spider toxin, but from bacteria introduced at the time of the bite. 572's uterus felt alright, a little larger in the left horn, definitely no calf in there. We went to town, picked up our fixed washing machine which broke down just after I'd finished doing my pre-trip washing - Mr Murphy and his law must have been off bothering someone else on that day. At the vet clinic I attempted to buy some copper for my cows. There are currently two preparation types available, the cheaper one usually causes a painful reaction at the injection site, and the more expensive one, recommended by the vets, does not, and apparently is less stinging for the cow. Today I could only buy the expensive type, so we will see if the cows object to it less - although I'm now so quick at giving it to them that it may be difficult to tell. I tried it first on the pregnant heifers and they didn't seem to mind too much. 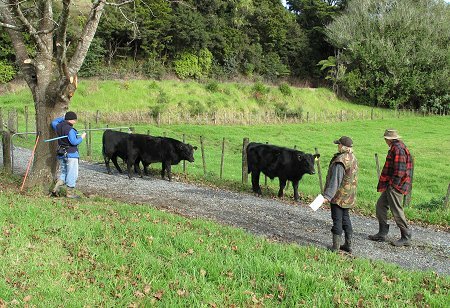 As I was finishing injecting the heifers, my expected bull buyers arrived to look over the little bulls and decide which of them they'd like. It's a bit of a gamble picking a bull when he's not even a year old, but it works out pretty well most of the time. In most years, my return customers are able to feed and grow their bull faster and better than I can here, so if they take him home now, he'll be ready to go out with their heifers when he's only a little over a year old. 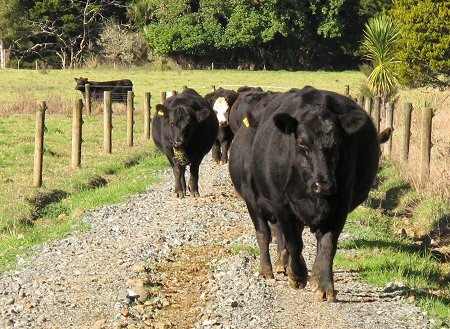 Walking the bulls in, I was looking very critically at them and noticed that one has quite long toes. His structure is therefore unsatisfactory, so I will have him castrated in the next few weeks - I would not offer such a bull for sale. It was decided that bull #91 best suited the requirements of my buyers and he will be going off to his new home sometime in the next week or so. When they'd gone, I put the bulls through the race and gave them the copper injection, then took them back to their paddock. I had a nice morning out with some visiting friends, and later Stephan and I met them in town for dinner. We went to the Bushman's Hut, a steak house restaurant which opened a few years ago. I've been there once or twice over the years since, but always found it very dark, with black decor and low lighting. We were one of three parties in the restaurant and when the other two tables had finished and gone, we began to get the distinct impression our hosts would have preferred us to leave! This is not an unusual experience in Kaitaia, and I don't like it a bit. If I'm going out to spend a reasonably significant amount of money on my dinner, I'd like to be able to enjoy a post-prandial period of relaxation while my meal settles and I finish my wine, or enjoy a dessert or coffee. But in Kaitaia you might expect to be regularly addressed as yous, have your dinner plate whisked away from you as soon as you put your cutlery down, regardless of the progress of any other diners at your table, and then have recently vacated tables sprayed with goodness-knows-what and wiped down in a manner suggesting the waiter/cleaner would prefer to finish her shift as soon as possible, so would you please get on with it and go home? My lovely Uncle Paul died this morning (sometime in the afternoon of Wednesday in Chile) and I thought it very fitting that I should spend the day doing the thing which caused him a great deal of mirth, which he described as harassing my cows. 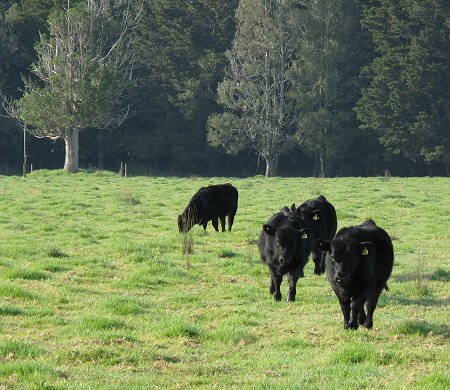 A second purchase I made at the vet's on Tuesday was some 7in1 vaccine, its most important constituent being to protect my cattle against Leptospirosis. Over the course of the day, I vaccinated the entire herd: pregnant heifers, cows (pictured on their way out to the 5d paddock), little bulls, Imagen (in the background in F1) and her little steer companion, and the young heifers. When I first created this site, our little lemon tree was ... little. It has had a chequered career, being heavily pruned early on by Ivy who'd managed to get into the garden one day and ate not only all the lemons, but most of the foliage. It recovered from that setback and a couple of years later we remodelled the area where it grew, which included uprooting it with the front-end-loader and replanting it elsewhere. Since then it has done very well. 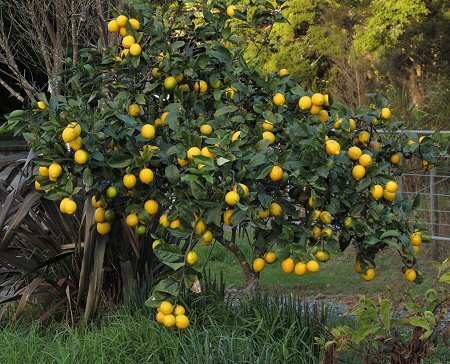 This year it has an enormous crop of lemons, so that some of the branches look like they'll need some extra support. The lemons are smaller than usual, probably due to the summer's drought. It is exactly this time of year when its cheeriness particularly strikes me, as it did two years ago this week. A truck was to come this morning for the bull we sold the other day, so I brought them in to the yards. So easy: just call them and they come running to the gate. 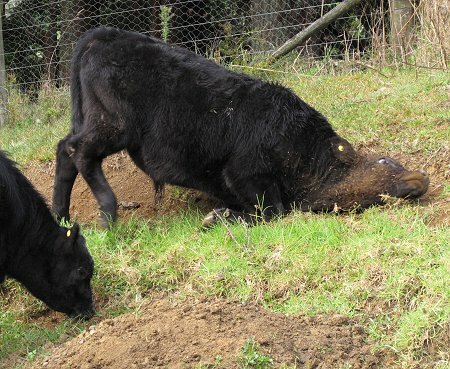 What is it about cattle and soil? They nearly all do this whenever they get the chance, but bulls are particularly enthusiastic. Bull #91 went onto the truck quietly and away he went to his new home.